As many of you know, I am a blogging veteran. It dawned on me recently that I have been blogging for over 10 years at this point. But is also interesting is that I find myself interacting on them less and less (although ironically, this article is on a blog). Why? Well because I have little bandwidth these days for incessant arguments. When I think about some of the most common arguments about church on blogs (whether ministry-minded blogs like CrossConnection or other Christian blogs), it is the church size preference argument. Most of the arguing, as I have thought about it, is actually from people who prefer smaller churches and then vilify larger churches. 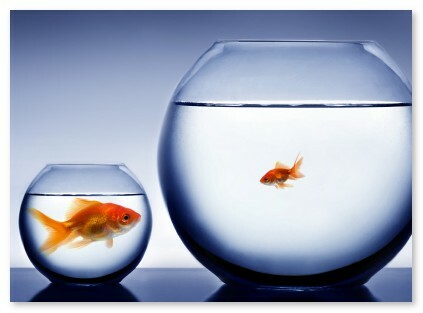 Although I don’t know of any larger church pastor starting a blog argument over church size, it is far to common to hear a mega church pastor speak down about a smaller church. I once stood in horror as a large church pastor asked a faithful brother of a smaller church, “How is your little work going?”. The work of God in salvation and in His people is never little. It is always huge. But, for me, I feel that I have a unique vantage point on this because of how the Lord has led me. I have been involved pastorally in 4 churches (3 as the church-planter and senior pastor). The three churches I planted were turned over to other pastors with less than 100 people. Now I pastor a very large church. Here’s what I have learned. Simply stated, the church is the church. Whether large or small, the church is the people of God together in community. Every church is flawed in some way, yet being grown up into her head, Jesus. All churches have budget problems, building (or lack thereof) issues, committed members and folks who just come and go. On every level, the church is the church. This was brought into stark focus for me recently as someone asked me how it was to teach at a large church. I said simply, it’s exactly the same, just more people hear the message at one time. I haven’t changed, the only difference is that now, if I look to the left or the right when I’m teaching, I’ll see myself amplified on jumbo screens (a terrifying sight). I still study the same, deliver it the same, pray that God uses it the same. After service, just like in a smaller body, some folks head for the doors and other folks want to spend time and talk. There are all the same people issues. In any church, large or small, most people have 10 truly close friends. That doesn’t change. A large church is not any less intimate than a smaller church. Why? Because intimacy is a heart issue not a size issue. Again, it’s all the same church. So why do I write this? Well maybe it is my hope that people will be okay with simply stating their preference for church size and dynamics instead of seeking to justify the preference by vilifying the other side. I also say this because as a church planter and smaller church pastor, I also tried to vilify larger churches. It don’t think I did it maliciously. I did it naively. But my experience has taught me that the church is the church, no matter how many people are gathered together. We are all one big family in Jesus. I, for one, am grateful for that. I resonate with your statement, “intimacy is a heart issue not a size issue”. I think the burden of larger churches is that a lot of people can slip through the cracks, without notice, and therefore the heart issues couldn’t be dealt with. Bringing the body together in more intimate settings (i.e. home groups etc) becomes more vital and leaders may have to be more intentional about facilitating that. But as you say, it’s not the size of the church (small, multi, mega), but seeking the best way to facilitate discipleship in the given setting. Good word, Daniel. I’ve been a church-planter, senior pastor, assistant, associate & lots of other roles. I’ve not been an enthusiastic pastor’s conference attendee for the very issue of size-comparison. I have a great respect for pastor’s who reflect the Lord with a genuine pastoral heart regardless of the congregation’s size. As far as the vilifying junk… it all comes down to jealousy and discontent, or just plain contempt, none of which honors the Lord or the “vilifier”. It’s kind of like teachers in schools… there are some great no-name teachers at small, unknown schools, and conversely, there are some not-so-great teachers at well-known and large schools. I’ve been in both classrooms. In America, more than in the rest of the world, the church has a very myopic, self-infocused view of the Body of Christ. So, I agree wholeheartedly with your closing sentiment and say Amen! #1 I was pastoring in a city where there was a much larger CC. I was attending a Senior Pastor’s Conference and someone looked at my name tag which indicated the city in which I pastored and he said to me, “Oh, you’re the guy ministering in the shadow of …” and he named the other pastor. I thought his comment odd. I immediately experienced the Lord embracing my heart with the words of Psalm 91, “He who abides in the shadow of the Almighty doesn’t dwell in anybody else’s shadow.” That was a precious word to my heart. #2 I have been part of a large church and I have learned the truth of Proverbs: “Better is a crumb in the attic with peace, than a house full of feasting with strife.” I thought to myself, “If this is what it means to have a large church, I want nothing to do with it.” I am content w/ my crumbs! Obviously, a large church doesn’t necessarily come with strife – and many of smaller churches do. I know this – I don’t have a preference for size, I have a preference for the peace of the Lord! By the way, I like your accompanying graphic – but shouldn’t the fish be reversed? Tim, the way I see it is kind of like the experience Daniel shared of the large church pastor talking down to the small church pastor. There can be a man of great spiritual stature in a small church and one of small (petty) stature in a large one. The size of the church doesn’t dictate the measure of the man. Great words all around everyone. And I totally agree that the size of a church does not measure a man. And that is why I think it is unfortunate that only large church pastors get the nod to teach at conferences. But that is entirely another discussion. Very good article. Church size and faithfulness to God have nothing to do with each other. I wish every pastor would just embrace the ministry God has given to them and be glad for whatever the Lord chooses to do in other congregations as well. God bless!